Thank you! 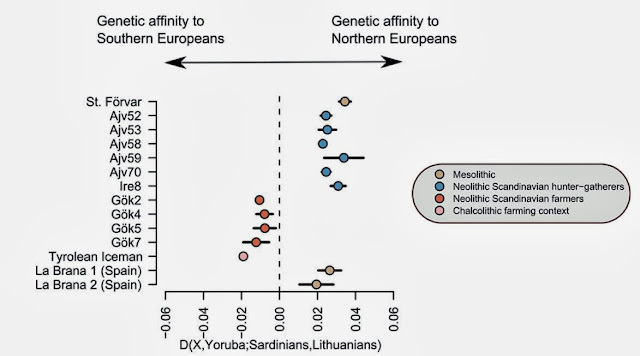 Does this confirm then that the North European ancestral component that you found in your ADMIXTURE analysis such as the globe13 one is the closest to the genetics of the Mesolithic hunter-gatherers of Europe? How old is Stora Karlso. Also is their any Y DNA, mtDNA, or aust DNA from him or her. I assume dthat the in globe13 the med in La Brana and other hunter gathers was inter marriage with farmers. But if Stora is 10,000 or more years old and has some med that means at least some was in Europe before spread of farming. What confuses me is farming spread to Europe from the Near east. Most likely spread with it Y DNA G2a, E1b1b v13, and probably some J1,J2, and T. Then mtDNa T(mainly T2 then T2b), J, K(mainly K1), possibly also I and W. But why do they have so much Med Otzie and Gok over 59% when you never see that in the Near east and why so little west Asian and southwest Asian. did they come from a small area in Europe that maybe had mainly Med? Gok and Otzie have extremely similar results even though one is in Sweden and the other alps Italy. This is evidence the farmers were a race and stayed pure most of the time. Modern Sardine maybe the last true people of that race or whatever you want to call it. But what happened why are Sardine the only ones. If it is true they stayed pure from hunter gathers there had to be some migration or major change that happened in Europe probably in the last 5,000 years Indo European migrations?? Overall I would think that European Palness(skin, hair and eye color) comes from the Paleo-Meslo hunter gatherer. therefore the main ancestor of modern Europeans or at least most. It would be interesting to get pigmentation genes from Neolithic, Mesolithic and Paleoithic Europeans. Compare their hair color and eye color percentages to modern Europeans. Maybe looking at 30,000 year old samples of aust dna we will see there were some families in Europe that went extinct while a successful migrating family coming out of a southern Refuge around 19,000ybp is who modern Euro's come form I don't know these are just idea's. La Brana 7,000 year old Mesolithic hunter gather north central Spain. Ajv, Ire8 4,800-4,000 year old Neolithic age hunter gathers Gotland, Swedan from Pitted ware culture. Gok4 a early farmer for Scandinavian 5,500-4,500ybp from Funnel Beaker culture in southern Sweden. Tyrolean Iceman 5,300ybp farmer in the early Chalcolithic/Copper age. Otzie aka Tylrolean Iceman even though is in the early copper age shows total consistency in Y DNA and mtDNA with Neolithic western Europeans about 2,000 years earlier. His aust DNA is very similar to Gok4 who was not copper age so more evidence being in the copper age did not change Otzie genetically. Ajv's and Ire8 all came from Pitted ware culture their total mtDNA was nearly 100% U4 and U5. Mesloithic European samples have majority U5 mainly U5b and La Brana's U5b2 is very popular. There are two U5 in Czech Republic from 31,155ybp and other Paleoithic U5's and overall Paleoithic is also dominated by mtDNA U. U5 probably originated in Europe and I have seen estimates from 36,000 to 50,000ybp. So that shows constancy at least in mtDNA in Mesolithic and Paleolithic Europeans. Since la Brana 7,000ybp in north Spain, Ajv's 4,800-4,000ybp in Gotland, Sweden, and now St. Forvar Mesolithic island in Baltic all show to be most related to modern North Europeans. The North Euro group in globe13 and other tests which dominated them probably traces back to Paleoithic Europe its ancestral form could have arrived 40,000-50,000 years ago. And will mean modern Europeans I guess mainly northern(what do they mean by northern exactly what area's) trace back a lot of ancestry in Europe that far. The La Brana's I saw in many aust dna tests had significant Meditreaen in them more than any of the other hunter gathers. I assumed it was inter marriage with in coming farmers who had just started to arrive in Spain. But maybe not because all the hunter gathers I don't know about St. Forvar had a trace of Med. It was a lot lower than almost any modern Europeans but maybe in globe13 and other tests North Euro was not the only group in Europe before farming. And isn't their North Euro out of modern variation. Why if the hunter gathers are so related to modern Northern Europeans is the mtDNA hg. 's of pretty much all modern Europeans fit more with the farmers. So it seems the farmers stayed pure and were like an ethnicity. But why are they so full of Med but don't have huge traces of mid eastern groups. Since the farming and their main Y DNA G2a, E1b1b V13, J1,J2, and T spread out of the mid east. No one in the mid east has in globe13 anything close to 59% Europeans have the highest. So where did these farmers come from obvisouly not from the ancestors of modern mid eastern people. And they don't exactly fit with modern Europeans except Sardine who they fit almost perfectly with. It seems the farmers and hunter gather were two distinct people. The Med farmers I guess dominated all of farming Europe. They farmers Sweden and alps why couldn't they do the same in France or Spain. So why today are Sardine the last in that family what happened to them. And why are there no Europeans who perfectly fit in the hunter gather family except maybe Soumi and Finnish. Modern Europeans are kind like a total mix of the two when did this mix happen. What change happened in Europe maybe in the last 5,000 years Indo European invasions? "This is evidence the farmers were a race and stayed pure most of the time. Modern Sardine maybe the last true people of that race or whatever you want to call it. But what happened why are Sardine the only ones". A possible explanation is that Sardinia was uninhabited until farmers arrived there thus preserving the 'purest' representatives of that people. "Why if the hunter gathers are so related to modern Northern Europeans is the mtDNA hg. 's of pretty much all modern Europeans fit more with the farmers". It is fairly easy to visualise a situation where haploid genes don't match aDNA. The offspring of an incoming male or female who mates with locals will leave behind just 50% of their aDNA but 100% of their haploid DNA. The next generation will only have 25% of the introduced aDNA but still 100% haploid DNA, and so on. "So where did these farmers come from obvisouly not from the ancestors of modern mid eastern people". Dienekes recently showed that the mid eastern population changed with the introduction of African aDNA after members of the population had entered Europe. Sorry, West of India in my previous comment. That only applies if take the Middle East to mean only the Arab-speaking parts of West Asia. As a general rule, the non-Arab-speaking parts of West Asia lack the African admixture. If you look back a few posts earlier on this block. You will see this all was explained already pretty well. Modern Near East is not exactly the same as ancient. Neolithic Near Eastern farmers were likely much more Similar to South Europeans and belonged to the Med or "Southern" component. Than a second few came out of East Africa and shifted the genetic landscape slightly towards East Africa. The Southwest Asian component is basically Med with some additional East African admixture. The simplest explanation is that the med component was always (pre neolithic) the Southern European people. Climate change will have hit the south first so they would start expanding first (as per the dating of the population expansions predating the neolithic). In other studies the Sardinians look like a relic, not a johny-come-lately. I don't by that modern near easterns have changed because of recent African admixture. Because when you look at their glob13 and other aust dna results they have almost nothing from Africa all Caucasian groups west Asian, southwest Asian, and med(with tiny North Euro that pops up uselly in Indo Iranian's). This African admixture defintley did not come from sub shara Africa and probably not North African Caucasins. I doubt it affected the entire mid eastern population. If your saying when farming first spread they were mainly Med like farming Europeans in Neloithic age and I guess copper. Then what ur saying is very west Asian and southwest Asian people from Africa suddenly spread across all the way to northern India and almost replaced the native mainly Med people. IS there evidence in mtDNA and Y DNA is U6 or L popular in the near east. Why is Y DNa J which would have originated in the Near east over 30,000ybp so popular there today. There was no major admixture from Africa into the Near east. "I don't by that modern near easterns have changed because of recent African admixture." Than you didn't understand Dodecad calculator very much and shold pay more attention to articles published by Dienekes because I remember Dienekes (the person behind the Dodecad Calculator) mentioned several times that the Southwest Asian component has a few East African related genes in it. He even made it clearer in one of his articles were he broke up the major components. Also if you take a look at Dodecad k10a calculator without Southwest Asian component, you see populations previously high in Southwest Asian component being partly "Read Sea" and this Read Sea component according to Dienekes is 1/3 to 1/2 East African. Not trying to be disrespectful but I find it honestly quite annoying when individuals who are not that frequently around and not that deep into the material try to explain other people who are far longer around, the results of Dienekes Calculators. So please instead of questioning the words of people like terryt make yourself more knowledgeable about the material. "That only applies if take the Middle East to mean only the Arab-speaking parts of West Asia. As a general rule, the non-Arab-speaking parts of West Asia lack the African admixture." Not 100% true, The African shift might not be that relevant in non Arabic speakers but it is still there in form of Southwest Asian which exists in Anatolians, Mesopotamians and as well Iranians. Also it's not only Arabs but Semite people in general (Jews and Syriacs/Assyrians included). What effected the Near East more beside the African shift is a West Asian shift, which I believe has it's origin somewhere in Iran where it split from it's Noth European and ANI cousin. "The simplest explanation is that the med component was always (pre neolithic) the Southern European people." If you take a better thought about that you will realize yourself that this idea does not make much sense and I will give you a few reasons why. 1. farming spread from the Near East this is a fact. 2. Neolithic European farmers belonged to Haplogroups extremely typical with the Near East and generally associated with it. Like Haplogroup G2a which has it's highest frequency and diversity outside Europe. E1b* which is also associated with the Near East and has a very high frequency on the Levant and I2a* which is associated with Balkans (or Near East). 3. As we know from now farmers started from the Near East, if they didn't belonged to the Med component from the beginning shouldn't we expect the farmer in the Balkan to show traces of "Near Eastern" contribution? If even the farmers in the Balkans with the biggest proximity to Near East and as "recent" as in the Iron Age were predominantly Med like, what does this tell us? 4. Even Neolithic Hunters and Gatherers in South Europe showed to be predominantly of the North European component. We had no data about mesolithic Europeans but now we have one individual case which shows us even mesolithic Europeans were more North European. So if the Med component in Neolithic farmers was "ancestral South European" how is it possible that South European Hunters and Gatherers and farmers while living almost in each other were so different? It is impossible to assume that two populations so entirely different could have coexisted and developed parallel as far as in the Paleolithic without heavily influencing or mixing with each other. And it's not like North European hunters&gatherers are more common in one part of Europe while farmers more comnmon in another. It's all around Europe where they coexisted like some 2 class society. 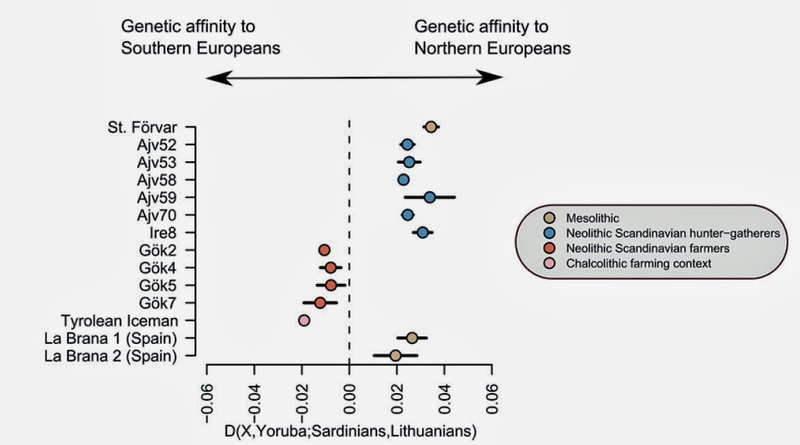 It's not wrong to assume that some of the farmers and the Med component might have arrived in South Europe earlier than in North during Mesolithic but it makes not much of sense to assume it is ancestral South European while the Hunters and Gatherers there show a different genetic signature. The problem with the report is the assumption that the hunter/gatherers of Iberia and those from the Swedish Neolithic were the descendants of native Europeans whose ancestors were in Europe from when the first modern humans set foot in Europe. That needs to be proved. What we know is that Mesolithic people and hunter/gatherers of the Neolithic age were super Northern European like in their ancestry results. In my opinion the post LGM period with ameliorating climates, loss of the ice sheets, and opening of habitats to animals hunted by hunter/gatherers like Red deer, the availability of fish like salmon in the unfrozen rivers and creeks would have spurred immigration of people from the area around Western Siberia into Europe. When ancient results of these Siberians come on line they too will be uber Northern European like despite not being geographical Europeans. Of course Europe's boundaries have shifted north and east since the days of the ancient Greeks. Originally Europe was only the Mediterranean zone of Europe. That only applies if you take the Middle East to mean only the Arab-speaking parts of West Asia. As a general rule, the non-Arab-speaking parts of West Asia lack the African admixture. Sardinians are a relic of Neolithic populations that entered Europe from the Near East via the Mediterranean. The La Brana samples are very different from Sardinians. The two groups can't both be indigenous to Southern Europe. The point is that the Middle Eastern population changed since the the first wave of farmers set out. The part of any direct or indirect African mixture in this is just a detail. For example Neolithic Europeans as well as modern Sardinians lack the West Asian genetic influence, while most modern Europeans have it at some level and modern Middle East full of it. So this is an example for a genetic mixture that came into Europe later than the first farming. Probably came later in the Western part of the Middle East too. Also we do not need to go as far as Africa. In historical times there were multiple know northward migration from the Southern Middle East (generally the wider Arabia) and virtually no know migration of the opposite direction (thought that had to happen earlier). Now,if we just look at the map, the most probable sources for migrant farmers of Europe (if we look after outside sources) are the Levant and Western/Middle Anatolia. And the populations of both region are known to be changed by the two example effects I mentioned. (Hmm you seem to be arguing that if the farmers came from the Near East then they should NOT show any Near East? I might have missed your point. (My personal view is that there were two basic genetic regions in paleolithic/mesolithic Western Europe. The Mediterranean aka Southern Europe, including North Africa. And Northern Europe (which may be further subdivided). This division predates the arrival of Homo sapiens. Neanderthals were split similarly into a Northern group and a Southern group in early studies. Not sure why, might be geographic). And it's not like North European hunters&gatherers are more common in one part of Europe while farmers more common in another. It's all around Europe where they coexisted like some 2 class society. (I dont agree with this interpretation of the data. I think there were lots of different isolated sub groups in Western Europe). "The La Brana samples are very different from Sardinians. The two groups can't both be indigenous to Southern Europe." I dont think the La Brana guys were typical of Southern Europe. I believe they were Northern European folk at the bottom end of their range (far Northern Spain) or a little astray. Northern Spain was just that little bit more similar to the lands further north. I suspect it was a good hunting area for folk with typical northern european style hunting skills. Later I think the Southern folk expanded up into Britain and Germany mixing in as they went up. This map is for neanderthal subtypes, but I think has geographic significance despite the probably relevance to an earlier time period. Also this map for the paleolithic, so a bit early, but illustrates my thinking. Slumbery, how do you know all Neolithic Europeans lacked the West Asian component? Has someone tested the genome-wide markers of LBK or Pre-Cucuteni farmers? I must have missed that. Can you point me to this study? The "Southwest_Asian" component exists in present-day non-Arabic-speaking parts of West Asia only as a minor component, mostly at the levels around 10%. What is more, the "Southwest_Asian" component seems to have already been present in West Asia at or close to those levels during the Neolithic and probably also pre-Neolithic eras, as Oetzi (the farmer individual from the Neolithic Italy-Austria border area) and Gok4 (the farmer individual from Neolithic Sweden) have that component at 7.6% and 8.6% respectively according to Dienekes' analysis. Moreover, Oetzi seems to be genetically closer to Africans than populations of present-day non-Arabic-speaking parts of West Asia are as according to Dienekes' analyses Oetzi has the "Northwest_African" component at 5.7% while that component does not exist or at most exists at noise levels in present-day non-Arabic-speaking parts of West Asia. Of course, in all these ADMIXTURE results of these ancient farmers we should take into account that the amount of markers available for ADMIXTURE analysis is relatively low at a degree that there is room for some small but nonetheless significant errors in their ADMIXTURE results, so we should be cautious when interpreting their ADMIXTURE results. But overall, the essential differentiating factor between these ancient farmer individuals from Europe and populations of present-day non-Arabic-speaking parts of West Asia seems to be the lack or relative lack of the "West_Asian" component of the K7b analysis and the "Gedrosia" component of the K12b analysis, and surely not the levels of African affinity, which, as Dienekes' analyses demonstrate, does not seem to be higher in populations of present-day non-Arabic-speaking parts of West Asia than in these ancient farmer individuals from Europe. For more clarification on the origins of the "West_Asian" and "Gedrosia" components, we need to see ADMIXTURE results of Neolithic-era and/or pre-Neolitihic-era individuals from West Asia. Only then we can know whether those components were already present in West Asia during the Neolithic-era and at which levels. In fact, they can. During LGM, the Po valley and adjacent then-dry Adriatic were prime areas to live, as were some of the Greek plains and islands. There is evidence for an advanced pre-neolithic fishing culture that spanned the islands and had no problem sailing to W / SW Anatolia and the N Levant (and likely enabled Cardium, thereafter). There was no geographic barrier, and also none between the SE Balkans, Thrace, and NW Anatolia. Most of Anatolia proper, and much of the region just S and E of it, was uninhabitable. Not only is it likely from that perspective that these were all the same people ("Mediterraneans"), this is also reflected in the ensuing Epigravettian, which spans at least Italy, the Balkans, and other parts of SE Europe. S France and parts of Iberia, which gave rise to the Magdalenian, instead spread to N and Central Europe. There is little reason to believe these people were very closely related to SE Europeans, at that time. IMO both were affected differently during the Gravettian. The reasons people in Italy or S Greece could not spread as quickly N are simple: there were geographic obstacles, and other areas to first expand into (or both): the Alps, the Balkan highlands, Bulgaria, Romania, Moldavia, etc. In the Younger Dryas, the entire area between the Adriatic, Greece, the Islands, NW Balkans, and the Black Sea cost is extremely homogenous concerning tool characteristics. The Sardinian component would then be well hidden within the Near Eastern DNA, or otherwise completely washed away by "Africans". This view of a Near Eastern identity of Sardinians is an Orientalist construct that lacks any evidence. I fail to see the logic of this conclusion, but this aside. La Brana may also be the relict of an earlier expansion of a certain Paleolithic or Mesolithic ethnic group of nomads. St. Favor is from some of the earliest human settlers of Scandinavia. He or She is about 8,873 years old and had mtDNA U4b1 which from I looked up it not common in Scandnavia today at all. And then the Neloithic hunter gathers from Pitted ware culture Sweden about 4,000-4,800ybp had almost all mtDNA U4 and U5 just like Mesolithic mtDNA from all over Europe mainly northern and eastern. La Brana mtDNA U5b2c1 from northern Spain 7,000 year old Mesolithic hunter gather. Shows also basicalley the same austomal DNA results as the Pitted ware hunter gathers and St. Favour. In globe13 I know La Brana and the Pitted ware hunter gthaers had over 70% north Euro I bet St. Favour since farming had not spread near him had over 90% or 100% that is why he fits even closer with modern North Europeans Norwiegan, Swedish, Polish and other Baltic people have about 68%, Finnish and Soumi have about 80%. Since there is total continunty with Paleoithic and Mesloithic European hunter gather mtDNA and now we have aust dna of Mesloithc hunter gathers who have vast majority North Euro. It makes total sense North Euro in globe13 is the only group unqiue to Europeans the only to originate in Europe. I think it devlopes from aust DNA of some of the earliest settlers of Europe with mtDNA U(later U5) and U2 both found in over 30,000 year old mtDNA samples in Europe. U4 is the only mystery maybe it originated in the LGM in Europe but I have heard in central asia with age estimates at 25,000ybp. Quick note. Figure 6 in the pdf shows the Swedish Neolithic hunter-gatherer along two Principal Component axis. THe CAPTION says these Swedish "Neolithic hunter-gatherers are outside the population structure of modernday Europe." The diagonal distance is actually quite substantial -- larger than the distance between Southern Sweden and France. There is also a large gap from modern Finland horizontally. This does not seem to support the idea either mesolithic scandinavians left much of a direct legacy to modern day Swedes. The neolithic "migration" seems to have a strong effect even this far north. That second link I posted on climatic regions did not work well. Here is another source. The lack of "Sardinian" genes in the modern Near East? In some of Dienekes Dodecad runs it reaches up to 50% in the Levant! This is not an Orientalist Idea but a scientist all around the world, which does not fit into your Pan European anti Near Eastern world scheme which I could observed in most of your posts. Also no one said that Sardinians are 1:1 the relict of ancient Neolithic farmers, obviously they are not since they show stronger impact of North European admixture wich was weaker in Ötzi as example. They just come closest to ancient Farmers but they aren't the same. "(G2 is not particularly associated with the areas currently associated with the origin of the neolithic (eastern Anatolia-ish), although that source may shift north with time. Plus with G2 the distribution of key subgroups at the time of the neolithic is increasing uncertain, in my mind anyway. It may already have arrived in Western Europe. E is more North Africa and in any case so far as I am aware the Levant is not touted as a strong candidate for the source of farming. )" I think you know the meaning of Diversity? I am not even going to debate about the origin of G2a in Europe because there is no doubt for me that it came from the Near East. It might not be that extremely common as in the Caucasus but with 10-25% in Anatolia, Iran and the Caucasus it's still more common. Even though today it is most common in the Northwest of Caucasus still it's highest diversity is in the area stretching around the Levant-South Caucasus and Iran. No doubt that this is the place of origin. About E1b1b* some of it might have arrived from North Africa but most of it no doubt arrived through the Levant into the Balkans and spread from there. Also note E1b* was only found so far in Iberian farmers (could easily be a Paleolithic individual who mixed into the farmer population. Cause in all other sides it was G2a (Near Eas) and I2*(Balkan-Near East). "(I dont agree with this interpretation of the data. I think there were lots of different isolated sub groups in Western Europe)." This is not an interpretation but this is how it is. They did not live geographically isolated (like East Europe one group and West Europe the others) they lived all around Europe side by side which does not fit the idea that both components might have originated there. And I really don't know ab out any other group than Hunters and Gatherers before the Neolithic expansion of farmers. So if the Hunters and Gatherers were pred. North European and the farmers which had to come ultimately from the Near East "Southern" like. How could the Med component end up being the dominant in the farmers? Who gave it to them if it was not their original component? If they got it through admixture with other unknown European population it should not be the most dominant component in farmers. "(We really dont have many samples for the relevant time periods. Most are internments, when it is probably from what we know of oral history that folk typically used fire and air burials possibly combined with cremations. This leaves no DNA. And there has been a tendency to allocate populations to one group or another on the basis of preconceptions, a cyclical argument. I think there were different cultural groups moving through the region, and those that favoured internment would be over represented in ancient DNA.)" I don't rule out that their might have been a earlier group which might have spread the Med component earlier in Europe but this is VERY speculative and unlikely cause otherwise it wouldn't be so extremely dominant in farmers and we would found at least a non farmer individual with higher percentage of this component because if we assume this component was given to farmers. We would need a at least 7 times as big population as the farmers to constantly mix up with them and than suddenly die out. And this is highly unlikely in my opinion. Also because some people can not imagine that a West Asian flow from the East of the Middle East an Some African from the South could not have changed the genetic make up of modern West Asia entirely, let me remind you that this was exactly what happened in Europe too. So why is it not possible that the same might happened in Western Asia? The Genetic relatives of ancient European farmers are no where to be found in Europe. Only Sardinians and Basques come close but than even them are at least 30-45% H&G admixed. We see from the Iron Age Balkan individual, how dramatically the genetic landscape of a territory so close to Western Asia, has changed. This should be more than just a indication what could have happened in Western Asia earlier. I want to apologize because I think I was a bit to direct towards Rokus, but the idea that farmer component dimished through new waves of immigrants and admixture in Western Asia is not only a "Orientalist" idea.